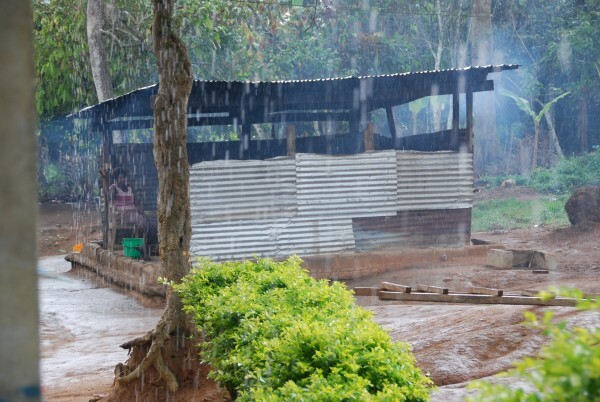 A dirt-floor kitchen is used to prepare three meals a day over an open fire for the children at the Baptist Orphanage and School Complex in Ghana, West Africa, in the summer of 2008. 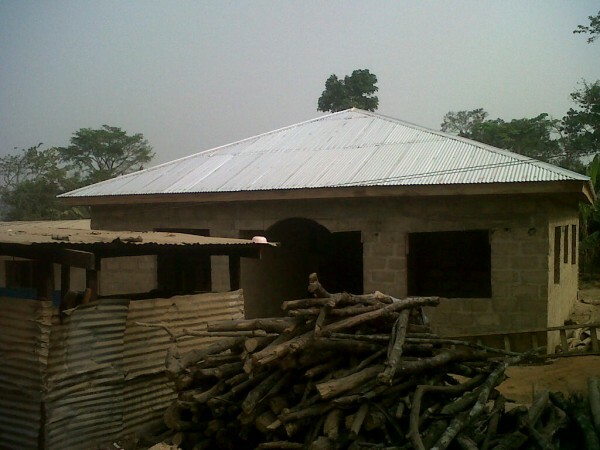 A new kitchen for the Baptist Orphanage and School Complex in Ghana, West Africa, planned and funded by Kristine Reid and Betty Jamison, is almost finished in January 2012. 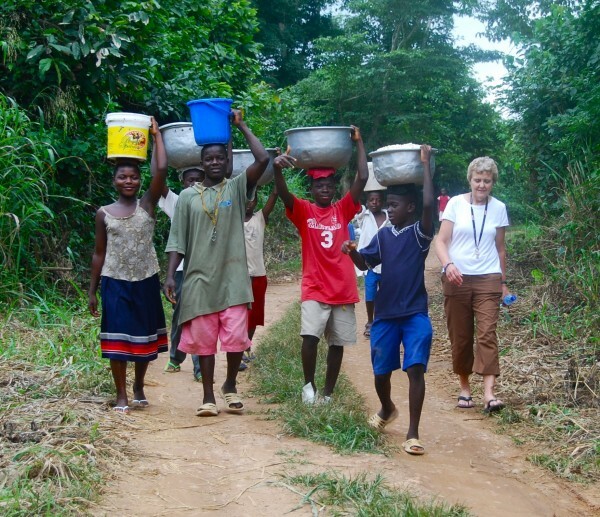 A group of kids from the Baptist Orphanage and School Complex are taking the corn they grew to the corn mill in the village crossroads in August 2011. Pictured are Patience (left to right), Emmanuel, Michael, Jacob (behind) and Samuel with Betty Jamison, a sixth-grade teacher at Bangor’s William S. Cohen School. Dorcas (left to right), Sylvia, Anita, Phillip, Stephen and Gertrude with Kristine Reid, a teacher at Bangor’s William S. Cohen School, are sitting in the center pavilion at the Baptist Orphanage and School Complex in Ghana in August 2011. 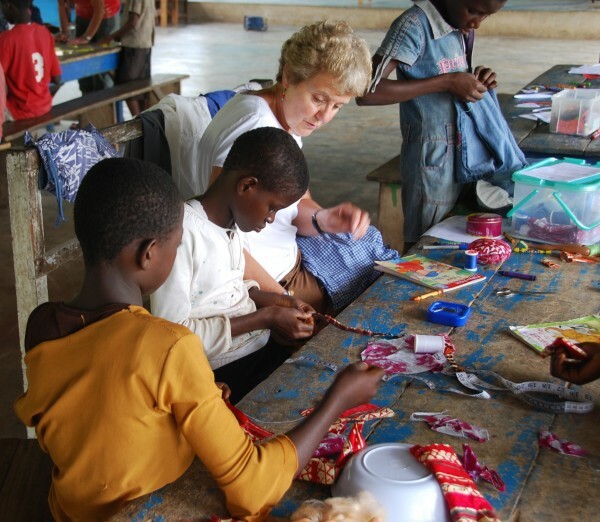 Betty Jamison, a teacher at the William S. Cohen School in Bangor, teaches children to sew seams, make button holes and make simple clothing at the Baptist Orphanage and School Complex in Ghana during the summer of 2008. Pictured are Dorcas (left to right), Doris, Jamison and Bertha. Augustine (left to right) practices geometry, Emmanuel works to read a book and Willy is writing his book report and working on editing. Doris listens to Emmanuel read with Kristine Reid, also known as “Mama Kris,” teacher at William S. Cohen School in Bangor, at the Baptist Orphanage and School Complex in Ghana in 2008. 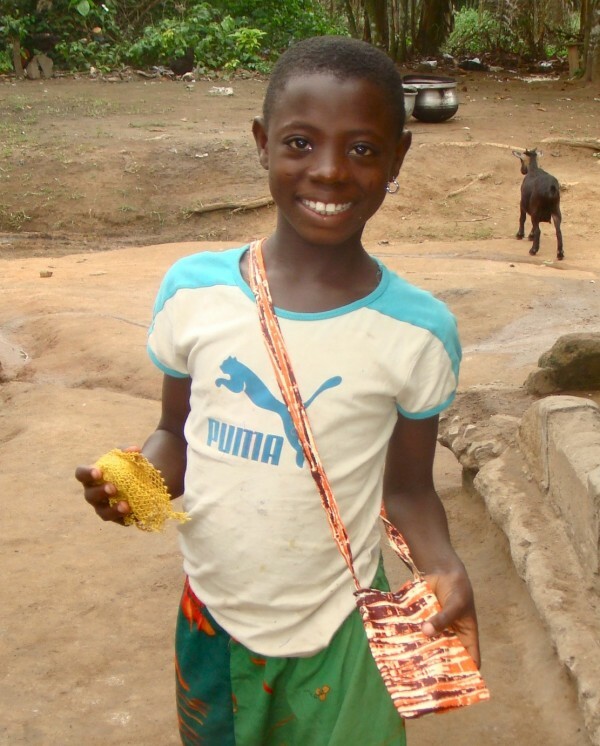 Sondra, who lives at the Baptist Orphanage and School Complex in Ghana, shows off her new purse, which she sewed with the help of Betty Jamison, a teacher at the William S. Cohen School in Bangor, during the summer of 2011. 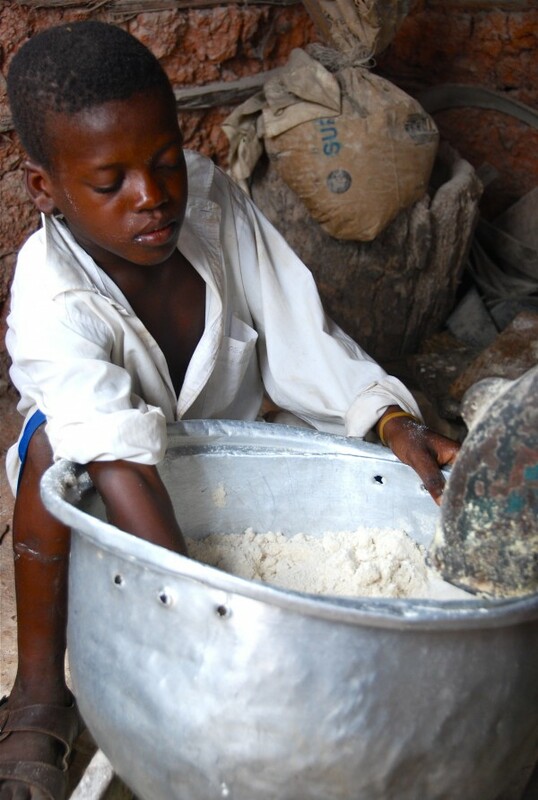 Jacob, who lives at the Baptist Orphanage and School Complex in Ghana, helps pack ground corn flour into bowls as it comes out of the grinder at the corn mill in 2008. Kristine Reid and Betty Jamison teach sixth grade in adjacent classrooms at the William S. Cohen School in Bangor. They need only walk a few steps to say “hello,” but over the years, side-by-side, they’ve walked much farther. They’ve trekked Maine’s 100-Mile Wilderness and voyaged down the Chesapeake and Ohio Canal, but it was in Ghana that they found their calling. In 2007, the duo embarked on their greatest adventure yet, one that continues today. Deep in the West African bush, four miles from the nearest electrical pole, the two teachers stepped out of an air-conditioned tour bus to be greeted by more than 100 orphans, eager to learn. They had just one day to spend with the children of the Baptist School and Orphanage Complex, commonly known as BASCO, then they were off again on the Primary Source tour of African schools. It only took a day’s worth of rich memories to pull Reid and Jamison back to that very spot in Trotor, Ghana, a year later. That time, they were on their own and would stay for several weeks. The volunteer house, the nicest building in the complex, had no running water, but the children never let the water barrel outside their door run empty — and they never allowed the teachers to lug their own buckets from the well. “It’s like someone dropped a dime in the middle of the jungle,” Reid said. BASCO was founded in the mid-90s by African Baptist minister Victor Ofori-Amoah, who after seeing homeless children sleeping under trees, took it upon himself to provide for them a home and future. At BASCO, more than 200 children are educated through eighth grade, including the 100-plus orphans who live at the complex. The children’s clothes consist of second-hand donations; their school books are old and sparse. They live on a diet of rice, pasta and a cornmeal mash called banku, served under a tin roof in a tiny kitchen open to the elements, as well as the goats and chickens roaming the 9-acre complex. To Americans, the orphanage might appear destitute, but to the children, it is a haven. It is their home. “You just get a warm and homey feeling that the kids are in a great place,” Jamison said. In addition to training orphanage teachers, Jamison worked every morning repairing and altering clothing, and Reid worked with older children on their literacy skills. “If there had been 20 of us, we would have been busy 24 hours a day,” Reid said. In return, the children showed them fields of crops, the local corn mill and a church with services brought to life through African drumming and traditional dance. And they shared their stories. “Many of these kids come from violent, horrible backgrounds, and often they don’t speak the same languages,” Jamison said. While English is the official language of Ghana, individual tribes speak different dialects for daily conversation. One family of four siblings, in particular, holds a special place in Jamison’s heart. Sandra and her three brothers joined the orphanage after their parents drowned. They were crossing a river when their canoe capsized. Augustine, the oldest of the four, knows the exact date they came to the orphanage — Nov. 7, 2009. “I like everything about being here,” he told Jamison. Though the teachers rarely talk to the children about their life in Maine, they do share with them some joys of the western world. This year, “Stuart Little,” both the book by E.B. White and the 1999 movie, is a BASCO favorite. “Stuart Little” is, perhaps not coincidentally, an orphan mouse. In 2008, a classroom was converted into a lab with 14 computers, a server and printers, thanks to Student Bridging the Education Gap Inc. of New Jersey. And in 2011, it was time for Reid and Jamison’s big project. The returned to Ghana during the summer and started planning a stone, enclosed kitchen with a place to prepare, cook and eat food. For funding, the teachers turned to friends and family to raise $10,000, a goal they reached by Christmas. The kitchen is now nearly complete. But there’s always a project to be done. A health clinic is on the horizon for the many children and nearby residents dealing with serious health issues such as sickle cell anemia, AIDS and tuberculosis. Then there is the matter of higher education — in this case, high school, which in Ghana costs about $1,000-$1,500 a year, said Reid, who estimates that about 30-40 children at BASCO are eligible but can’t afford to attend. Many stay at the orphanage, where they are always welcome. They look up to Prosper, one of the original orphans and BASCO’s big success story. He graduated high school at age 22 and is now completing an internship at an insurance company in Ghana’s capital, Accra. For information about BASCO, visit basco-ghana.org. Their Facebook page can be found at facebook.com/basco.ghana.